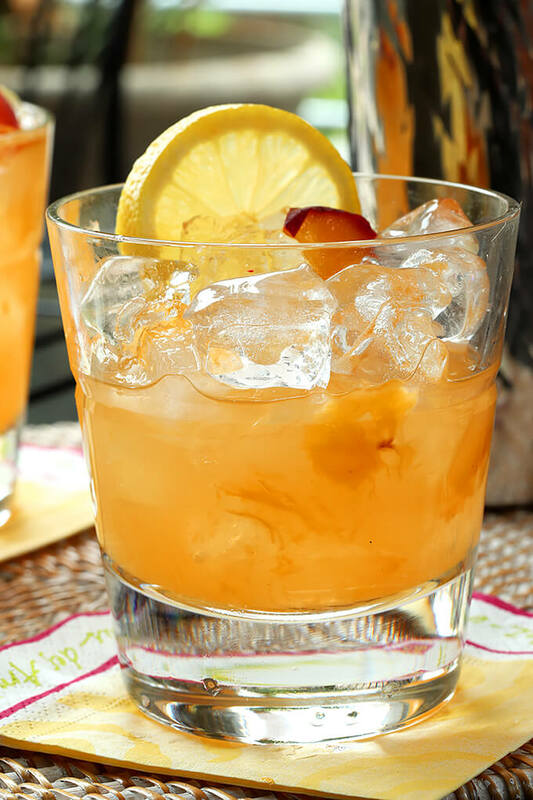 This Kentucky Peach Bourbon and Vodka Cocktail is wonderful and lighter than a straight bourbon cocktail so it’s perfect for summer. Hello…do you remember me? My name is Barb and when not cooking, grilling and making cocktails, I am a certified Gardenaholic! If you’ve notice my absence, or heck even if you haven’t, I’ve been in the yard, the front, the back and in between! I moved into my home a bit over 4 years ago, so this is my fifth summer. Almost hard to believe; I lived in my previous home for 23 years and when I moved the yard pictured above was nothing less than idyllic. Thirty year old mature trees swaying in the breeze; gardens filled with mature plantings and designed around a huge assortment of perennials. 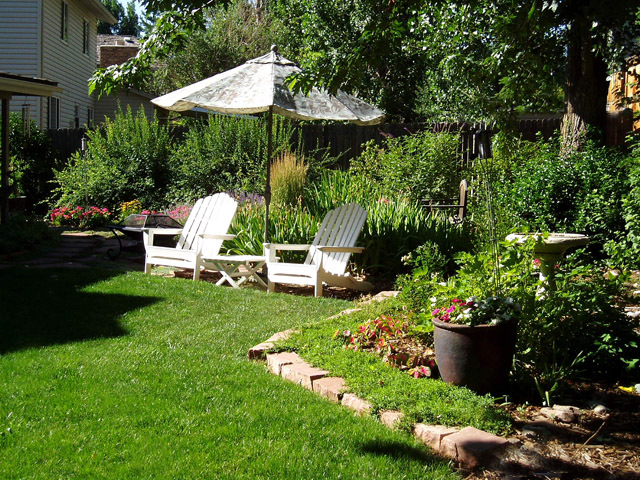 It was lovely and while I loved my home, leaving that garden is what I’ve mourned the most. I thought I would be happy with less and I was wrong. 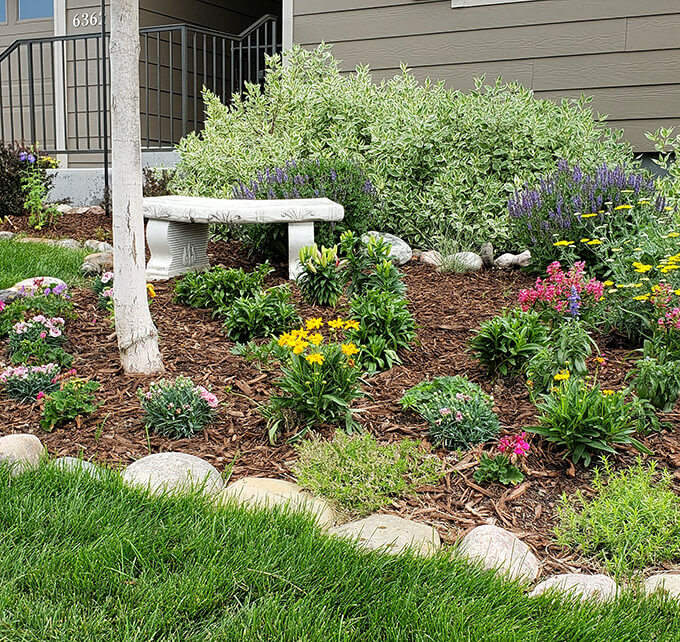 One day soon I’ll share some before and after photos but one of the many things I did this year was finish this perennial bed in front. Where once was grass, now is flowers! I’ve had the sweetest boy up the street come help me the last couple of weekends; I’m sort of on my last legs. Even professional athletes take time to recuperate and I’ve just kept after it every day. I’m beat but also exhilarated. It will never be my old garden because neighbors are SO close but it’s taking on a character that is feeling good. And I love it enough now that I’ll be taking more photos outside too. This cocktail was the first! I’ll be honest; I’ve never been big on a lot of flavored vodkas. Vodka is not supposed to taste like cake or cotton candy so I shied away. But I’m not so stubborn I wouldn’t try something that sounded like it would work. And vodka infused with fruit flavors sound better to me; heck I make a ton of cocktails with vodka and fruit so for me it’s the perfect marriage. This cocktail includes Seagram’s Peach Flavored Vodka. And Bourbon. Yes, I know, an unlikely pairing it seems but actually it was perfect. Vodka does not have a lot of flavor on its own so adding the peach flavored vodka to the bourbon and lemonade makes for a much lighter and more flavorful cocktail than if just bourbon alone. I added a muddled peach to the mix in a cocktail shaker to further intensify that peach flavor and it was good to go. Truth…sometimes I have an idea or a recipe and it sounds good but maybe I shouldn’t admit this but I’m assuming it will be and don’t actually take a sip until I’m done with the shoot. I guess years of cocktail making give me some confidence that it will turn out. And I usually like them too. This one? See the evidence with the snap from my phone? I honestly could have finished it off with one long drink I think it was SO good but I had a moment of clarity and remembered, probably not a great idea. I finished, put away all my equipment and then sat and enjoyed it. And liked it well enough that no calls when out to the neighbors to share drink number two; nope, I drained the ice from the second one and it’s in the fridge waiting for me to enjoy tonight. Sorry Amy and Kevin, my two best tasters, not this time around! 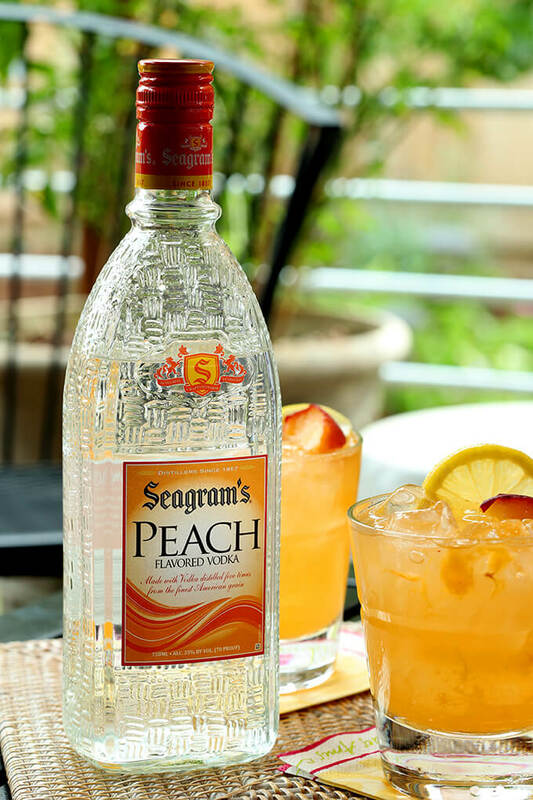 Honestly this is one amazing summer cocktail; get your Seagram’s on, buy a peach or two and make sure you have lemonade and you’ll see for yourself. Cheers! 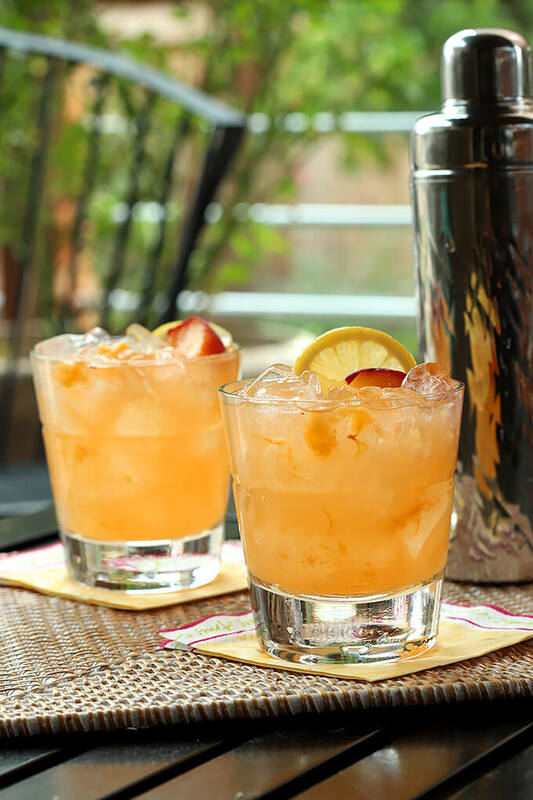 The post Kentucky Peach Bourbon and Vodka Cocktail appeared first on Creative Culinary.